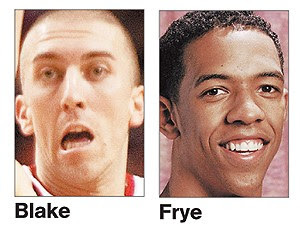 The Punahou Summer Basketball Camp for boys and girls is set to take place from June 9th through 11th and will feature two of the most popular Trail Blazers, Steve Blake and Channing Frye. Coach Mike Taylor said a contact in Portland contacted him about the possibility of holding a camp in Hawai'i featuring pro players. "Bottom line, they (campers) get to meet and take pictures with two NBA players and listen to their success stories," Taylor said. "(We're) lucky to have these two come in. They wanna give back." I know absolutely zero about this camp but thought it was at least worth sharing for those parents out there looking for an out-of-state basketball camp for their kids. Growing up in Montana pretty much left me jealous of all the kids that had the opportunity to attend basketball camps featuring NBA players. Take advantage of these! By the way, that photo at the top is the photo they used on their announcement...fantastic.